Trump pal and former New York City mayor Rudy Giuliani, who’s kept a low profile since inadvertently contributing to the failure of the president’s Muslim ban, has a new gig. 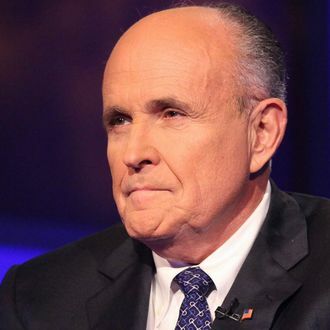 The New York Times reports that Giuliani has been retained by Reza Zarrab, a 33-year-old gold trader accused of violating United States sanctions against Iran. Another Trump ally, former U.S. Attorney General Michael Mukasey, has also joined the defense team. Mr. Zarrab has been charged with facilitating millions of dollars in illicit transactions on behalf of Iran and other sanctioned entities through the use of front companies and false documentation. Prosecutors have said he “allegedly tricked numerous U.S. financial institutions into processing barred transactions.” Mr. Zarrab has also been charged with conspiracies to commit money laundering and bank fraud. He has pleaded not guilty to the charges, and was ordered detained without bond. Turkish president Recep Tayyip Erdogan has questioned the charges against Zarrab, with whom he seems to have a friendly relationship. Per Bloomberg News, in 2013, “Turkish prosecutors accused Zarrab of bribing the country’s cabinet ministers in a gold-trading operation worth at least $12 billion, a charge he denied. Erdogan called the investigation a coup attempt, and all charges against Zarrab and members of his administration were eventually dropped.” Giuliani and Mukasey reportedly traveled to Turkey last month to discuss Zarrab’s case with Erdogan. According to lead defense attorney Benjamin Brafman, Giuliani and Mukasey will not “have any involvement in the trial preparation or trial in this case,” nor will they appear in court, making it difficult to avoid the assumption that Zarrab hired the two in the hopes of benefiting from their ties to Trump. After all, this administration has demonstrated an openness to unseemly associations with Turkey.